If you are an OHCC alumnus and have recently had a baby, we would like to send you an OHCC Lil’ Oakie onesie free of charge! Please fill out the form. 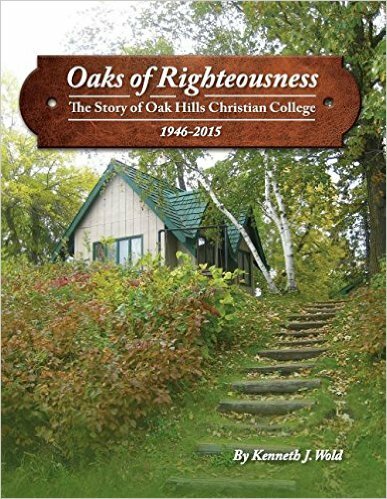 Drawing from historical documents along with stories and anecdotes submitted by many alumni, staff, professors, and former administrators, the 70 year history of Oak Hills Christian College is given a thorough presentation. Struggles and conflicts, along with victories and progress, demonstrate God’s preservation of a small northern Minnesota school into the Twenty-first century. Kenneth J. Wold is faculty emeritus and was an instructor of music for 42 years at Oak Hills Christian College. He has a diploma from Oak Hills Christian Training School, a BS in Music Education from St. Cloud State University, St. Cloud, Minnesota, has done graduate studies at Bemidji State University, Bemidji, Minnesota, and completed a Master of Arts in Music Ministry at Western Seminary, Portland, Oregon.